The Starav 25 has a waist belt to make sure that the load is supported and reduces unwanted movement on your back, whilst the air-flow back system helps keep you cool and comfortable throughout the day. 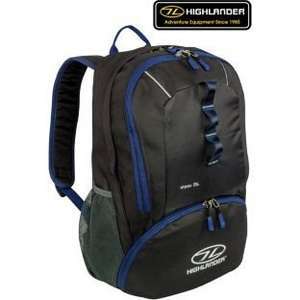 The 25 litre capacity consists of three compartments and twin mesh side pockets to keep your belongings organised. The Starav features an internal hydration pouch with hydration port for easy access to your water and multiple attachment points to allow for extra accessories and essentials to be brought along on your day out. The main compartment features a two way zip for easy access and the splashproof fabric is practical whatever the weather. It is cheap and it looks cheap. If you just something to throw a few school books in or to put your gym gear in then it'll be fine but to carry any weight for any length of time, this just won't suit your needs. It is cheap and it looks cheap. If you just something to throw a few … It is cheap and it looks cheap. If you just something to throw a few school books in or to put your gym gear in then it'll be fine but to carry any weight for any length of time, this just won't suit your needs. You can tell by looking that its gonna be uncomfortable. Read the reviews. The main thing they are saying is "very comfortable" Do you even research before buying things? It isn't uncomfortable at all! Also see post 2. Read the reviews. The main thing they are saying is "very comfortable" Do … Read the reviews. The main thing they are saying is "very comfortable" Do you even research before buying things? It isn't uncomfortable at all! Also see post 2. Looks uncomfortable...therefore I won't buy it....voted hot though.